They flew a Vickers Vimy bomber, powered by two Rolls-Royce Eagle 360 hp engines. Those were V-12 engines, the first aircraft engines to be developed by Rolls-Royce. On this day two pilots took off from Canada towards Ireland on the first continuous flight across the Atlantic Ocean. 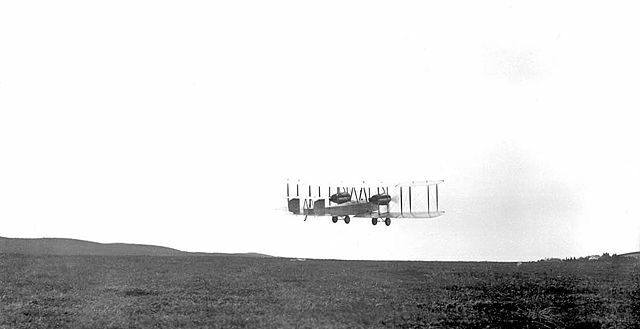 The British aviators in question were John Alcock and Arthur Whitten Brown, and they were piloting a World War I-era Vickers Vimy bomber (the war had ended only seven months earlier), which was modified for the purpose of such a long flight without stopping. The Vickers Vimy bomber was powered by two Rolls-Royce Eagle 360 hp engines. Those were V-12 engines, the first aircraft engines to be developed by Rolls-Royce (which later became very famous precisely for its aircraft engines). It took Alcock and Brown less than 16 hours to fly across the entire Atlantic Ocean. To be precise, it took them 15 hours and 57 minutes to fly to the coast of Ireland. They landed in a clearing which seemed like a green meadow out of the air but was actually a soft wetland, which made the landing problematic. But, the pilots were not injured. In total, they flew 3,040 km at an average speed of 185 km/h from Canada to Ireland. They received a prize of 10,000 pounds, which was an extremely large amount at the time. Indeed, they were both knighted a few days later by King George V. That gave them the right add the prefix “Sir” to their names.